The story of millions of Lego pieces washing up on beaches attracted huge interest when first told by the Magazine. The list of places where the toys have been spotted is still growing. Beachcomber Tracey Williams has been picking up Lego along the Cornish coastline ever since a container spill dumped millions of the toy pieces into the sea in 1997. Since the curious tale was reported by the Magazine, dozens of people have contacted Williams to say they, too, have found parts of the much-loved toy scattered on shores. They mostly got in touch via the Facebook page she set up about the drifting toy pieces from various Lego sets, many of which were nautical-themed. Most of the people who've contacted her found Lego around Cornwall, she says. 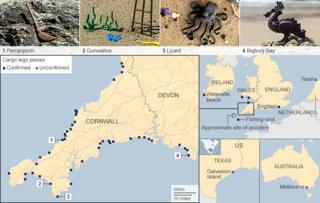 "From what I've been told, Perranporth is a hotspot for brooms, and the Lizard seems to be a hotspot for octopuses." Brighton, East Sussex, some 300 miles away, is the furthest confirmed report she has received to the east along England's southern coastline. But some of the sightings have come from much further afield. Nearly 4.8 million Lego toy parts fell overboard from the Tokio Express container ship in a storm off Land's End on 13 February 1997. Williams says the pieces which now drift up on an "almost daily basis" in numerous locations are flippers, spear guns, seagrass, scuba tanks and life preservers. Elsewhere there have been sightings of the lost Lego in the Gower Peninsula, Wales, and seagrass, spear guns, life preservers and scuba tanks have been found recently at Freshwater West in Pembrokeshire during beach cleans. Finds have been made abroad too, at Waterville beach in Kerry, Ireland, where an octopus matching those lost from the Tokio Express was found around 2007. Also, another octopus was taken recently to a beachcomber's fair in Florida, which had been found earlier this year at the western end of Galveston Island in Texas. Williams was also told that someone took Lego to a beachcombers' fair in the United States and claimed it had been found in Texel, in the Netherlands. And a blue Lego diver's flipper was found "some time in the last five years" on a beach at Port Phillip in Melbourne, Australia, which theoretically could be from the Tokio Express. Williams has also been told of a fisherman in Cornwall who often brings up Lego when trawling in his boat 25 miles offshore, south of Newlyn. The items caught in his nets, which are still coming up today, include toy roof tiles, door frames, car chassis, octopuses, seaweed and a lot of bricks. Other people to contact Williams include a teacher in - aptly enough - Cornwall, Connecticut, in the United States, who plans to teach pupils about the spillage, and university students in the UK who want to use the Lego to study microplastic in the oceans. "Some people have suggested that divers should go down and try to locate the lost container," Williams says. "One man contacted me to say he could put a team together to attempt this. Another wants to create a theatre piece based on the whole story. "It's great that all this interest raises awareness of the whole issue of marine debris and ocean pollution, especially when it's among children." Lego has said the Tokio Express incident was "very unfortunate" but ultimately had nothing to do with the Lego Group. The company did express an "overall concern for the environment" and said it was focused on eliminating waste at its production sites which could potentially become marine litter. Other parts of the lost cargo seem to have come to light also. Sarah Matthews, 58, of Fowey, Cornwall, says she found a piece of a broken Lego crate after the container spill occurred. "It's part of a lid and was washed ashore after a storm, mixed up with seaweed. I think it was on Poldridmouth beach and I found it in 1999 or 2000. "It's lived in my garden ever since, but I'm going to give it to Tracey." According to a report in the Times in March 1997, car parts, including cartridges which explode to inflate air bags, were also believed to be carried within some of the other lost containers. The Lloyd's List maritime journal reported a few days after the spillage that the cargo also contained wheelbarrow wheels and thousands of lighters. Only three containers from the lost load were recovered intact - the rest were assumed to have sunk and were not considered a hazard for shipping, the journal added. US oceanographer Curtis Ebbesmeyer, who has tracked the story of the Lego since it was spilled, says the Gulf Stream ocean current comes over from the United States and then "impinges on the UK, like hitting a knife edge" around Land's End. "Looking at the map, it seems like the current is pushing drifters - the pieces of Lego - up the English Channel and they're probably now entering the North Sea. "And they also seem to be getting pushed up the west coast of the UK also, judging by the finds that have been made there." Ebbesmeyer believes the claim of a Lego item from the Tokio Express being found in the Netherlands is "probably true" but says he is less sure about some of the other international finds. "Lego is a popular toy and kids leave them on beaches all around the world," he said. "It's difficult to know whether they're from this container spill. "But the octopus found in Texas could be from the Tokio Express. It matches the drift pattern across the Atlantic. Hard to know for sure, but it is possible."